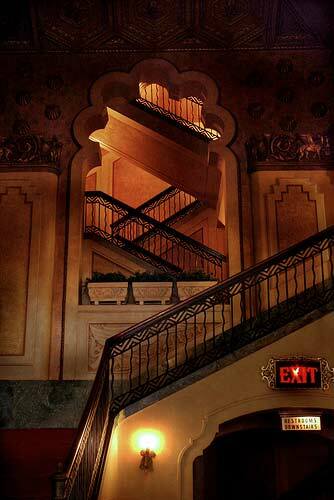 Staircase at elegant Alabama Theatre for the Performing Arts in Birmingham AL; Photo © Duncan McKinnon on Flickr (used by permission). Named the "Showplace of the South" by the movie mogul Adolph Zuker, the theatre was used primarily as a movie palace for 55 years (with the exception of the weekly Mickey Mouse Club and annual Miss Alabama Pagent) until closing its doors in 1981. In 1987 the theater was purchased by a nonprofit corporation (Birmingham Landmarks Inc.) and became a performing arts centre. As the new Alabama Theatre for the Performing Arts, the theater began hosting many live events in addition to films. Presenting over 300 events, including broadway shows, ballet, opera, rock & roll, parties, weddings, and fashion shows, the Alabama Theatre draws hundreds of thousands of patrons to Birmingham every year. 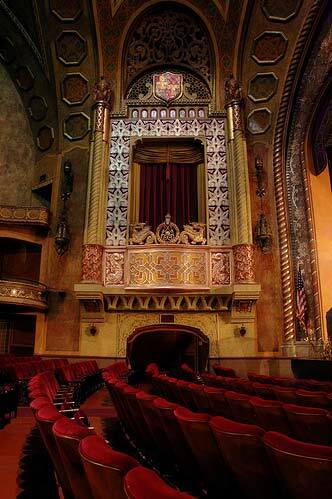 The Theatre underwent a complete restoration In 1998, transforming its faded grandeur to a sparkling and lavish 1927 look. Balcony inside historic Alabama Theatre for the Performing Arts; Photo © Duncan McKinnon on Flickr (used by permission).